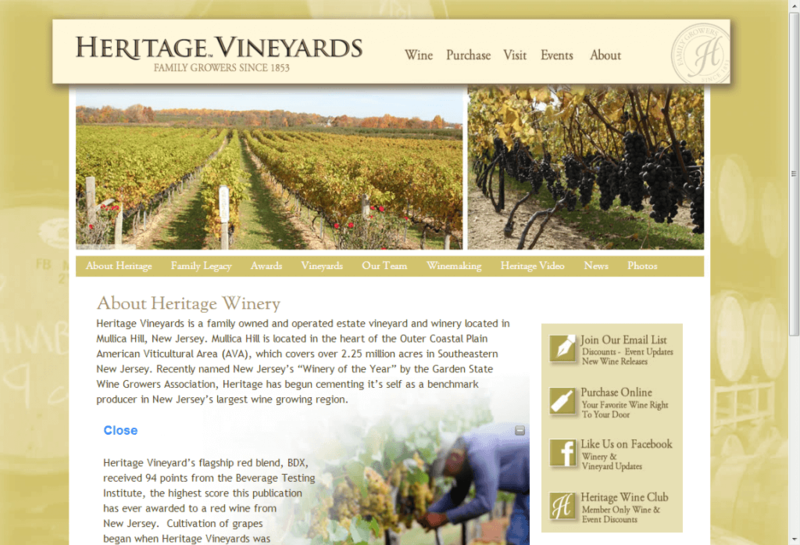 Our NJ web design team is pleased to announce that a new and improved website (a WordPress Web Design) for Heritage Vineyards is officially launched! Since 1853 Heritage Vineyards, in Mullica Hill, NJ, has been farmed by the same family – that’s six generations! What began as apple and peach orchards has blossomed into a successful and award-winning wine business for Bill Heritage and his wife, Penni. And now, with their eldest son, Richard Heritage Vineyards continues to produce exceptional products and uphold the family’s long-standing agricultural tradition. With such high standards, it’s no surprise that Heritage Vineyards was honored with the title of New Jersey’s 2011 “Winery of the Year.” Check out their newly redesigned and refined custom WordPress website at HeritageWineNJ.com. 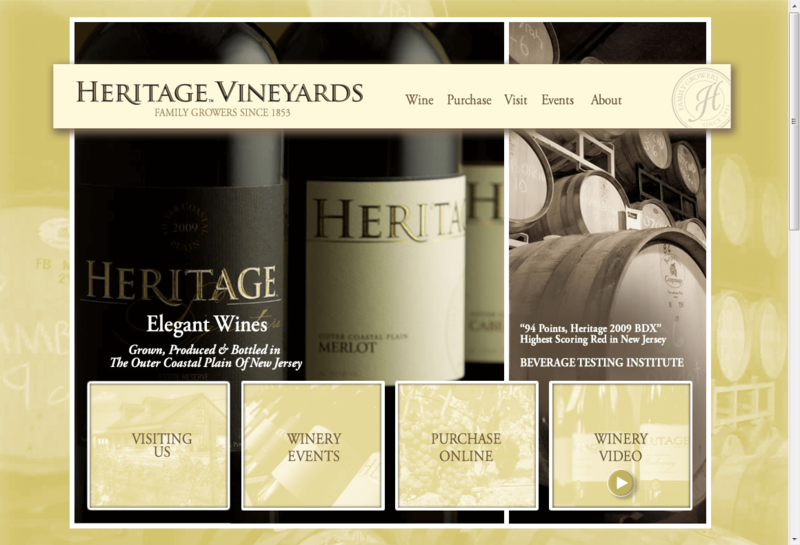 Designing a custom WordPress website for Heritage Vineyards allowed us to make some pretty significant upgrades to the website. The first noticeable change that you will see is the slideshow powered by jQuery technologies. The images showcased are of the beautiful vineyards and the wine making process. The jQuery technology, unlike Flash, makes the slideshow completely iPad and iPhone compatible. Other key features of Heritage Vineyard’s custom WordPress website are the interactive event calendar which highlights upcoming winery events. Also, the full Ecommerce capabilities that benefit both the customer and business experience with smooth and secure online transactions. Along with full HTML5 capabilities, video integration, the client also has the ability interact with their social media presence (Facebook, Twitter, Instagram, etc.). The new home page of Heritage’s New Website; powered by WordPress. We fully customized the Heritage Vineyard site on the WordPress platform, instead of using a pre-made design, to make sure that the layout offers the most visual impact possible. There are very few NJ web design firms that have the ability to develop a WordPress Web Design with a truly custom front end web design; most just use WordPress design templates. Also, built using the WordPress platform, allows HeritageWineNJ.com to have a fully capable CMS (Content Management System) that gives the client the capacity to update the content of the site with ease. The CMS platform allows the client to edit and manage content (such as photos, announcements, videos, and downloadable forms). All of which is made possible through a login to the backend administrative system. The client managed website is easily accessible from anywhere at any time, provided the computer has a stable internet connection, to make any needed changes. The WordPress CMS platform is a cost effective option and efficient solution to adding website content without using risky proprietary software; not to mention it’s easy to use. Web Site Development & Planning, Web Site Redesign, Banner Creation, Web Site Copywriting, Web Photo Galleries, Website Hosting, Content Management System (CMS), Online Shopping, Custom WordPress Web Design, Online Video, Online Events Calendar, Interactive Contact Form, Interactive Maps. Basic SEO Services, Marketing Strategy, Content Strategy, Social Media Integration.